Brig. Gen. William E. King IV, commander, 20th Chemical, Biological, Radiological, Nuclear, Explosives (CBRNE) Command, spoke at Non-Conventional Threat CBRNe Europe on Feb. 24 in Amsterdam. Brig. 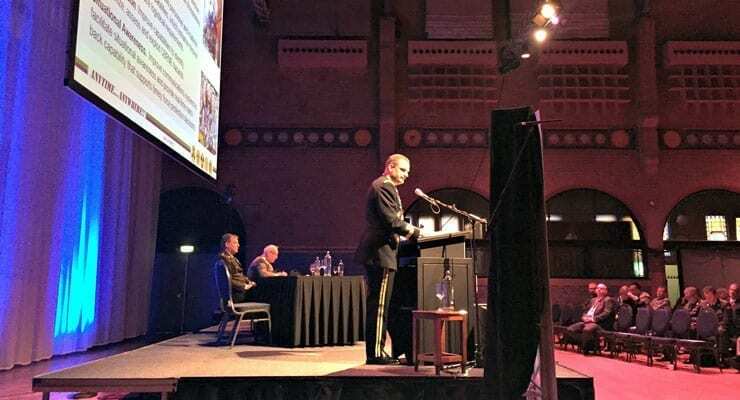 Gen. William E. King IV, commander, 20th Chemical, Biological, Radiological, Nuclear, Explosives (CBRNE) Command, speaks at the NCT CBRNe Europe conference on Feb. 24 in Amsterdam. King discussed how 20th CBRNE Command is building CBRNE capabilities with our allies and partners in Europe to overcome current and future challenges in operational CBRNE defense. “Every combatant command faces the risk of a CBRNE hazard – whether it manifests itself as a deliberate attack on U.S. interests, or results from an accidental release,” said King. Worldwide there have been dozens of CBRN attacks from 1970 to 2014, some of these attacks include the Aum Shinrikyo sarin attack in Tokyo in 1995 and the recently confirmed chemical attacks in Syria. To help build the capabilities and relationships of CBRN and explosive ordnance disposal forces worldwide to combat these threats, the 20th CBRNE Command regionally aligns its brigades and groups to build partner capacity and strengthen alliances worldwide. The command is building partnership capabilities in U.S. Southern Command conducting multinational training in Panama as well as Counter-Improvised Explosive Device training. In Africa, the 20th CBRNE Command conducted over 10 military-to-military, humanitarian de-mining missions in the last year. In the Pacific, the command builds relationships with the CBRN and EOD forces throughout the region by conducting training with the Australians, Japanese, and Koreans. In U.S. Central Command’s area of Operations 20th CBRNE Soldiers are working with Afghans, Iraqis, and Kuwaitis, and over the last year, the command has conducted training sessions and engagements with Jordan, Israel, Oman, Saudi Arabia and the United Arab Emirates. In Europe, EOD elements from the 20th CBRNE Command support NATO in Kosovo, and routinely works with the United Kingdom and Germany. While in Germany, King met with German Col. Henry Neumann, commander, Bundeswehr CBRN Defense Command. King said his meeting with Neumann was “productive” and discussions included ways to improve CBRN defense and improve their forces interoperability when conducting combined CBRN operations. They also explored areas of potential collaboration in CBRN capabilities. King and Neumann agreed to continue close communications between their two forces as they move forward on improving collaboration between their two forces. King also met with Lt. Gen. Frederick “Ben” Hodges, commander, U.S. Army Europe. They discussed how the 20th CBRNE Command could contribute to the development of NATO’s weapons of mass destruction capabilities, and assist in building partnership CBRN and EOD capacity in allied and partner nations. With units on 19 posts in 16 states, the Aberdeen Proving Ground-based 20th CBRNE Command is the Defense Department’s only multifunctional formation that combats global chemical, biological, radiological, nuclear and explosive threats. The one-of-a-kind command trains with joint, interagency and allied partners around the world. Article courtesy of Ryan Donald, 20th CBRNE Command, adapted. Global Biodefense is an official media partner of NCT CBRNe Europe.